Recently, my husband and I bought our first house after renting for several years. Throughout my adult life, everyone I know has told me that renting is just throwing money away and buying is much better. I mean when you think about, why would you want to spend several years paying off someone else’s mortgage? When you look at things from a financial perspective, however, you realize that renting can often be cheaper than buying depending on the cost of living in your area. This is how it was for us. I am certain we will spend more money on housing and living costs now that we own a home vs. renting. So why did we buy a house when renting was cheaper? Sure, we may be paying more for our mortgage and we will be on the hook for repairs and maintenance costs. However, we’re getting more bang for our buck by upgrading from an apartment to a house. We have more space now, an extra bedroom, a yard, and a garage. Our rent was less than $900 per month and we wouldn’t be able to rent the house we have now for anywhere near that. Houses for rent in my area are anywhere around $1,700 – $2,000 per month. In other words, since renting was so cheap for us, our expenses had nowhere to go but up if we wanted to get more space. Living in an apartment for the last 6 years allowed us to save a ton of money. As a result, I paid off a lot of debt. I paid off my student loans and my car loan and my husband was able to pay off his car loan and credit card debt. As a result, we now have much less debt than we did a few years ago. Now, we only have my husband’s student loans and some medical bills. The minimum student loan payment is small and just around $150/month so our remaining debt is super manageable. That said, with less debt, we can afford to spend more money on housing and still have money left over to save and finish paying off the remainder of our debt. This is just one of the many benefits that come with paying off your debt. It frees up more money to spend on your values and keep a positive cash flow. If my husband and I still have car payments, credit card debt, etc. we probably wouldn’t be able to afford a more expensive housing payment. I don’t want to pull the kid card, but being a parent definitely influenced my decision to purchase a house now. My son has lived in an apartment with me since he was two and we moved out of my mom’s house. Recently, he casually mentioned that in just 6 years, he will be 14-years-old. I don’t want to think about him growing up, but it’s happening quickly. If there was ever a time to buy a house for him to grow up in, the time would be now. Don’t get me wrong, there’s nothing wrong with living in an apartment or raising a family there. It works well for some people and they like the maintenance free lifestyle. For us, I didn’t want to keep telling my son he couldn’t run in the house, jump around at night, or put stickers on his bedroom wall. It was a very personal decision my husband and I made, but we didn’t make it blindly. Wanting to own a home to raise our family in meant we had to prepare ourselves financially to make the move and deal with a higher housing payment. We paid down a ton of debt, saved money, and improved our credit scores in the years leading up to this purchase. We settled on a home that we could afford and put up a generous down payment. I would not recommend buying a big home that you can’t really afford because you have kids. Kids can be happy literally anywhere. This is another big reason why we decided to buy now. We wanted to own something and build equity as an asset. Sure, we took out a mortgage so we don’t own our home outright. I’ve also heard from numerous sources that buying a home that you’ll reside in is not an investment/asset and I do agree with that. Nevertheless, to us it’s worth it to spend a little extra on the mortgage and have our home go up in value year after year. While an equity increase is not guaranteed, it’s almost like a built-in savings account. We also plan on doing upgrades in our home when we can to customize it and drive up the value. When it comes down to it, owning a home does provide you with an asset because when things get tough or if you need to downgrade, you can always sell your property. Renters don’t have that option. I’ve had quite a people offer up their opinion on whether or not we should have bought a house this year. To each his own, but from my reasons given above it’s clear to tell that we wanted to inflate our lifestyle and could afford a bigger house payment so we got one. Whenever I hear about lifestyle inflation, it’s always so negative. People say “don’t get a new car” or “don’t buy that house and keep taking your lunch to work” and I get it. If you don’t have the money and your current spending doesn’t align with your financial goals, then, by all means, DON’T inflate your lifestyle. On the other hand, there’s a time and place for everything. So when can you inflate your lifestyle then? If you’ve got a handle on your finances and plenty of savings piled up should anything go wrong, why not inflate your lifestyle a bit if things are going well? Be sure to own it with intention when you do. It’s okay to give yourself permission to spend more money on things you value. We valued owning a home that provided us with more space and freedom. We were okay with inflating our lifestyle and paying more than our previous rent. Once we admitted that, we were able to rework our budget and lower other expenses that didn’t fall in line with our values. What about you? 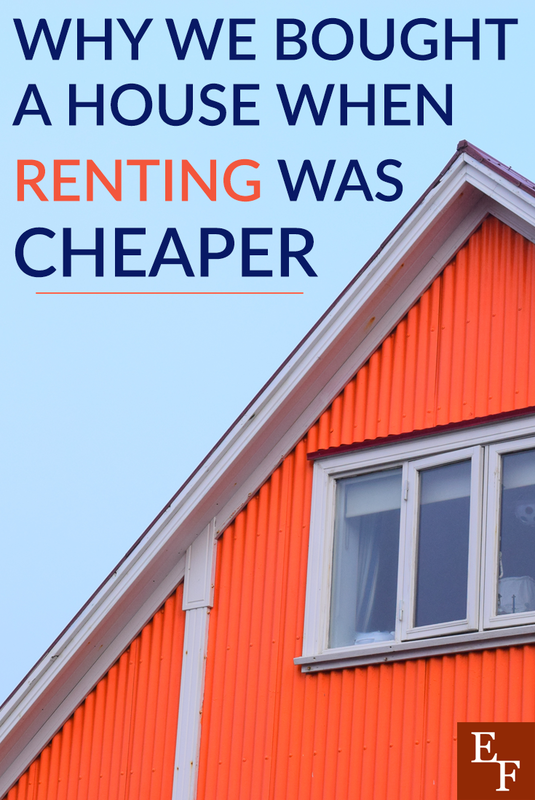 Do you own even though you know renting is cheaper? Have you ever intentionally inflated your lifestyle for a good reason?